Come join fellow students, faculty, and staff and their families on the quad (between Binkley and Stealey) at 5:00pm for the Spring Campus-wide Cookout on Monday, May 3rd. 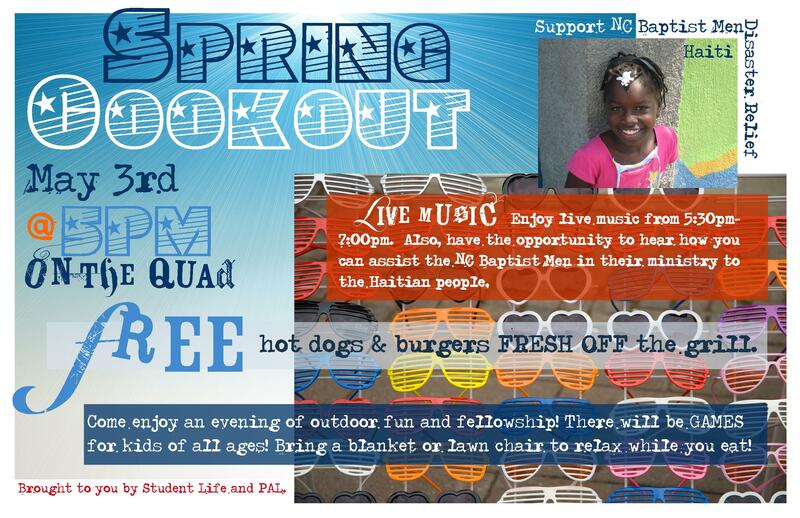 There will be live music, games, free food (hamburgers and hot dogs), and fun! Bring your lawn chair, blanket, and yard games for a great evening of fellowship to begin the semester. Enjoy live music from 5:30pm-7:00pm. Also, have the opportunity to hear how you can assist the NC Baptist Men Disaster Relief in their ministry to the Haitian people. They will be receiving donations as well as needed items such as medications and small sanitary items. List of Donation Items: Children’s Tylenol and Ibuprofen (no liquids), Childrens Vitamins, Children’s Allergy Medicines, Antibiotic First Aid creams and ointments, tootbrushes/toothpaste, band-aids/gauze wraps, antihistamines, decongestants, flu/cold medicines. 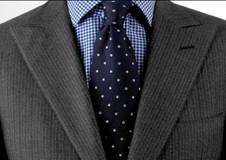 Students, faculty, and staff—Jim Tatum, owner of “Suits for Servants” and beloved in the SBC, will be in the Ledford Center May 4 and 5 selling his suits for $100 or less, and ties for $5. This is a great gift for any student, pastor, faculty, or staff member. Please plan to take advantage of this opportunity. It’s time for spring cleaning! If you would like to make some extra money by selling your unwanted items, we invite you to participate in the Campus-Wide Yard Sale. The size of the yard sale has been steadily increasing each semester, so this is a great time for you to get involved! We are having the Campus-Wide Yard Sale on Saturday, May 8 from 7:00 AM to 11:30 AM. The event will take place at the gravel parking lot in front of the Sharing Shop (next to Wake Forest-Rolesville High School). If you would like to participate by selling items, please contact the Housing Office by April 30th in order for us to accurately plan. You can reply to ctillis@sebts.edu or call the Housing Office at 919-761-2400. Tables will be provided for the first 20 students who sign up. It’s spring cleaning at The Locker! 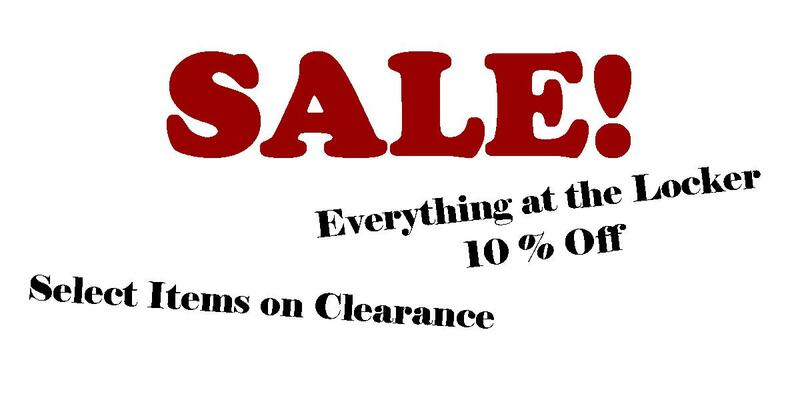 10% off of everything in the store and select items on clearance. The Locker is the exclusive home of SEBTS apparel. Look good while representing the school! Comments Off on SALE at The Locker!! International Students Services at Southeastern would like to invite you and your family to teh Spring International Banquet. The banquet will be held at Ledford Center on Saturday, May 8th at 6:00p.m. Come experience a culturally diverse International Banquet. You will enjoy beautiful worship, a message from God’s Word by Dr. Daniel Heimbach, food from all over the world, great fun and fellowship! You must RSVP by May 3rd 2010. To RSVP, email international.office@sebts.edu or call Fred @ 919-761-2363. A healthy church is a church marked by sound doctrine. As Paul instructs Titus, a pastor must “hold firm to the trustworthy word as taught, so that he may be able to give instruction in sound doctrine and also to rebuke those who contradict it” (Titus 1:9). Yesterday’s challenges to sound doctrine may seem obvious to us today. But that doesn’t mean today’s challenges are as transparent as we may think. The second 9Marks at Southeastern conference will consider why biblical theology is essential for the church, where it’s unexpectedly challenged, and how pastors can lead churches to exhibit the faithfulness Paul requires of Timothy. Speakers include Daniel Akin, Thabiti Anyabwile, Matt Chandler, Mark Dever and David Platt. Student cost is $35. Students, faculty, staff, friends, family, and neighbors are invited to the home of Professor and Mrs. Heimbach for interactive conversation on any question you have. Following the format of Francis Schaeffer for L’Abri, we seek honest answers to honest questions guided by confidence in the reliability of the Word of God. The Heimbach’s live at 550 Robinson Drive directly behind the nearby WF/R High School football stadium. Meetings are from 7-9 pm on April 23, and May 14. Refreshment provided. Drivers please park on the street, not in the driveway. Southeastern Baptist Theological Seminary seeks to glorify the Lord Jesus Christ by equipping students to serve the church and fulfill the Great Commission (Matt. 28:19-20). Searching for a Ministry Position?